JR Sketches: My Kitchen - The Prequel. Ok, here I go again. 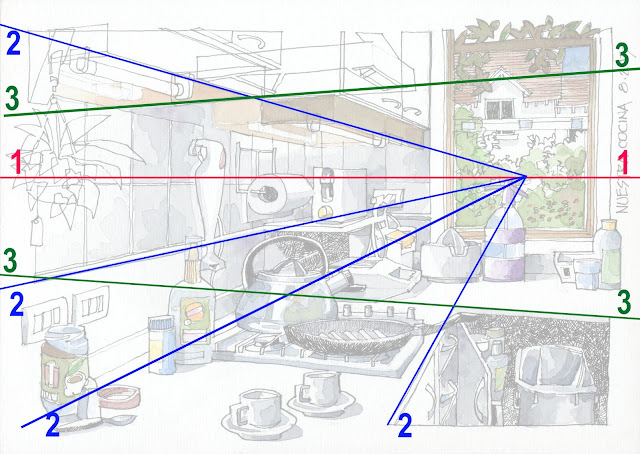 I uploaded my "step by step" yesterday in various Facebook groups and received a lot of questions about whether I use a ruler or how I fix the perspective. Yes, I use ruler and pencil and "construction lines". I searched carefully into the USK Manifesto and found no mention against it. No sins commited, so I can use a ruler and still be in a state of grace!. I am sorry… I know there is people that despise rulers, abhor of pencil pre-work and like to rough it. Well, maybe I am too old, but if I can have a choice I prefer sleeping in a bed, since the floor feels harder for me lately. All of this is to be done with a ruler. 1) I try to find an horizon line (HL - Red). It is an horizontal line that is usually at eyesight height. (The sea horizon is always there). And then I find a vanishing point (VPoint), a dot into the HL where all the lines tend to go to. Then I need to look around for some strong lines (BLUE) that go into that VP. Here I see some lines in the kitchen top and in the tiling that I can use. I draw them with the ruler. 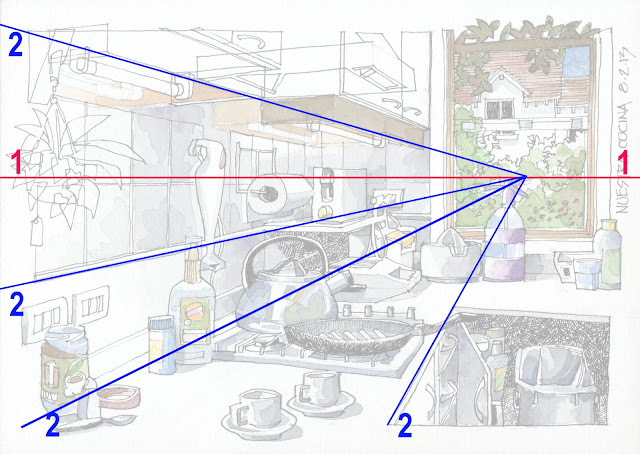 2) There is another set of lines (3) in the other direction, perpendicular to the blue lines. Those vanish into a VPoint thats off the drawing, so I kind of have to figure them up. Here they are, two green lines . 3) Once the main blue and green lines are placed, I divide the space between them proportionally, so I can use all these lines as guide for the freehand drawing that comes after all this. I divide the narrow end in -say- four spaces, and the same at the wider end. And them I draw some more lines (three thinner green lines here) that I will use as guides and erase after ink work. 4) I do the same with the blue lines, those that go to the Vpoint, here I make two sets of spaces I the narrow end and two sets in the wider, and, again, I place six thinner lines, three and three. Now I can kick the ruler away but I do have a group of lines I can trust, and into which I can move without much danger. All the rest of the drawing can be made by guesswork, and that brings softness to the whole thing. But this "initial spatial structure" helped me undestand how the space where I am drawing works. If I get lost, it will not be by much. And, all verticals, as a general rule, are vertical.